An easy and cost effective way to change up the feel of a smaller room is by painting it. Yes paint colours can make a small room feel larger. Neutral Light Paint Colours will make a room appear bigger almost instantly. Using the popular gray paint colours in lighter shades will create a cozy and modern feel to any room. Lighter shades of gray, blue, greens in the neutral paint palettes are good go to paint colours for any room in your house. White paint is also very popular as homeowners like the fresh feel it gives as well as it makes everything look bigger. It reflects better on both natural lighting as well as unnatural interior lighting, giving the illusion of a lot more space. 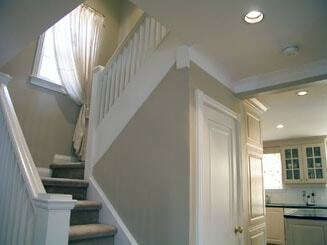 Painting the trim, baseboards, crown moulding or cove wood work that highlights any room in your house can add depth. 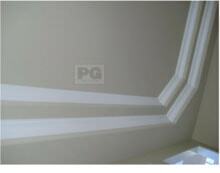 Usually painters recommend painting and trim, moulding, cove, crown molding and baseboards in a semi gloss white. Remember that if you paint everything in a white or light coloured paint colour you can add all the pizzazz in your accessories. Adding a punch of colour in the carpet or sofa or even throw pillows creates the complete look to any room. You may even want to paint one focal wall a.k.a. accent wall in a bolder and darker colour and this will still help make a small room look more spacious. If you need to hire a painting company in the Ottawa area contact us to schedule your estimate and consultation.